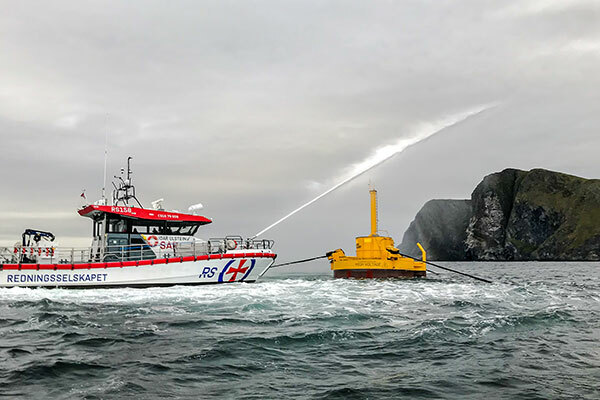 In early 2016 a full size Waves4Power system was launched approximately half a Nautical mile south west of the Runde Island, south of Ålesund in Norway. The system is comprised of a WaveEL buoy – eight meters in diameter – connected via a dynamic low voltage cable to a connection hub. A transformer in the hub increases the voltage to 22 kV before transmitting it via a subsea cable to the shore-based power grid. June 2, 2017 the system started delivery of power to the local electric grid. 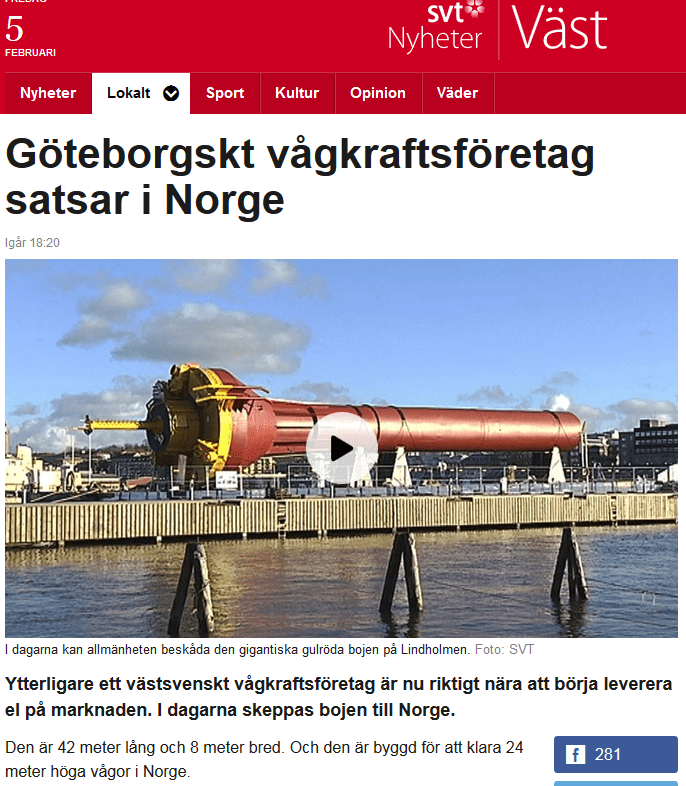 On September 21, H.M. King Harald V of Norway officiated a ribbon cutting ceremony for the system, inaugurating the future industrial development of wave power by Waves4Power in Norway. The system was fully functional on site from June 2 until mid. November 2017, at which time – two of the mooring lines were mechanically impacted (cut straight off) by unknown means – the buoy had to be recovered from site. The plan is to reinstall and grid connect the buoy in 2019, after upgrades. The installation was initially permitted for three years at the Runde site, but may be extended as the system is built to last for 25 years. The Waves4Power project at Runde is a real-life demonstration of the functionality and survivability of the wave power system. 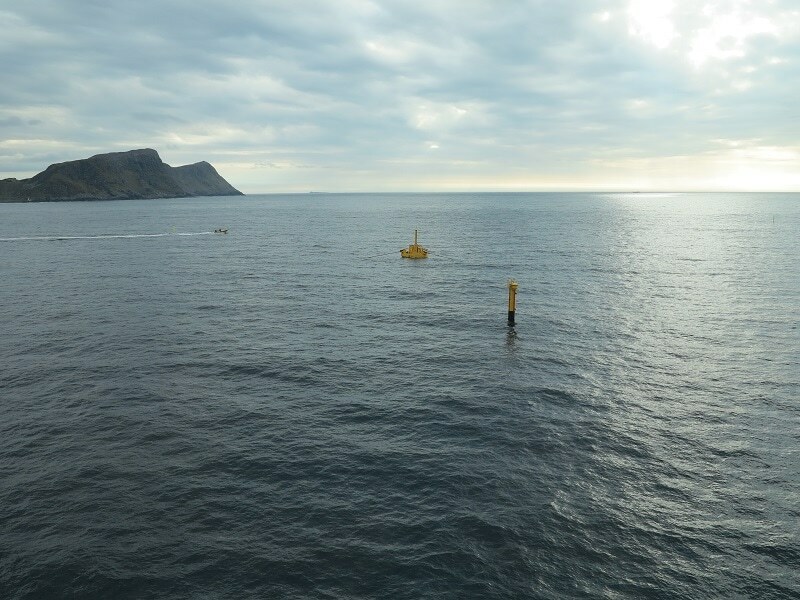 The wave climate at Runde is ideal for a demonstration of highly efficient wave power production, and the infrastructure is already in place. The system is designed for an operational life of 25 years. The WaveEL buoy and the mooring system is made to operate in a regular wave climate with waves as high as 12 m, but is designed to survive the estimated “50-year wave” of 25 m.
September 21st was an important milestone for Waves4Power, their sponsors, investors, development partners and the local community. This marked the official Royal Opening of the Waves4Power wave power site at Runde, Norway. Attendees enjoyed a day of seminars and presentations by partners at the Fiskåholmen shipyard in Vanylven, in Møre og Romsdal county. HM King Harald V of Norway attended the event, taking a boat ride and visiting the WaveEL buoy in action, as well as cutting the ribbon of our official opening in the market square close to the harbor of Fosnavåg, in front of an enthusiastic crowd of a couple thousand people. 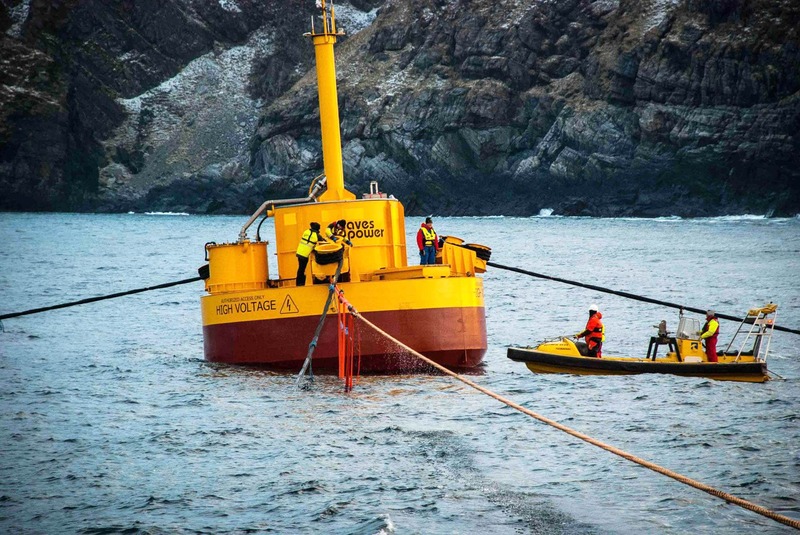 The WaveEL system was connected to the national power grid in Norway on Friday June 2, 2017 after the installation of the connection hub on site next to the WaveEL buoy – off Runde Island – a couple of weeks prior. The WaveEL buoy which was launched at Runde in February of 2016 successfully survived a harsh season in stormy winds and waves topping off at 14 meters. It was taken off site late in 2016 and towed to a local shipyard for maintenance and upgrades before redeployment at Runde in April 2017. The new proprietary 22 kV sea cable – developed by nkt cables for these particular applications – was laid from the connection hub to the connection point on shore, a distance of about 3 km, at the same time as the hub was installed. 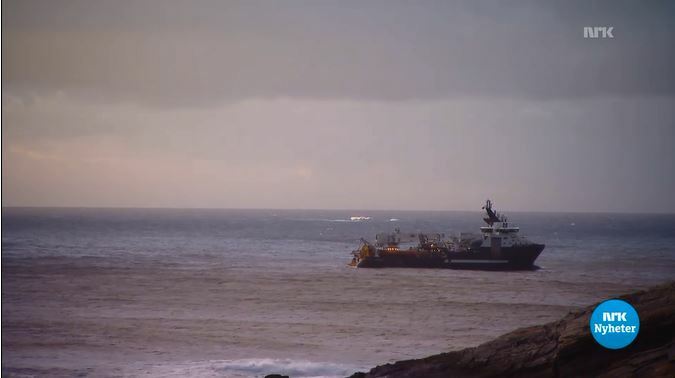 After the successful installation of the WaveEL buoy on site at Runde, the launch of the remaining system has been temporarily halted at midnight Friday, due to a problem with the connection hub, which was damaged during a corrective action with a misplaced mooring line. The Olympic Zeus had to leave for an operation in Africa early Saturday morning so the launch operation can not resume until her return. In the mean time we will investigate the cause of the damage and corrective actions will be taken to have the hub ready for launch upon Zeus return. WaveEl buoy is finally in the water. After a stormy night Olympic Zeus was able to place the three anchors. The off load of the WaveEL buoy from Zeus started at 5.45pm after moving to gentler water. Buoy was later in the evening towed to installation site. Click for LINK to NRK video and article. TV stations and news papers cover the arrival of WaveEL to Runde. The crew is planing the launch. On route from Gothernburg, Sweden to Runder, Norwary with Olympic Zeuz. Moving WaveEL from Eriksberg to Arendal. Public workshop and open house at Eriksberg. 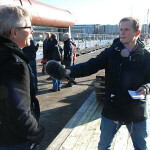 Swedish Television visited the Gothenburg harborwith a report about WaveEL . (in Swedish).